Central America has an overall humid, tropical climate with distinct dry and rainy seasons throughout the region. However, the weather can vary from country to country, and some countries have multiple climate zones. Typically, in mountainous areas, temperatures dip lower than those in areas with lower elevation, but usually no colder than around 50 degrees Fahrenheit (10 degrees Celsius). And temperatures in the hottest areas of the region typically top out just below 90 degrees Fahrenheit (32 degrees Celsius). The exception to this overview is Guatemala, which can see temperatures range from freezing to the 100 degrees Fahrenheit (38 degrees Celsius), depending on where you are and when you are visiting. Typical hurricane season for Central America can stretch from June to November, but it's usually concentrated in August through October, so if you're planning a trip during this time, make sure to take precautions and know what to do in the case of an emergency. Central America also has a distinct wet season (also known as "green season" because of the lusher landscape during this season), but the months can vary slightly around the region, so check the country-specific information below. While your planned travel and activities can be more interrupted during this time, it's still worth visiting if you know how to prepare and pack. If you want more consistent weather, head to the southern parts of the region closest to the equator. 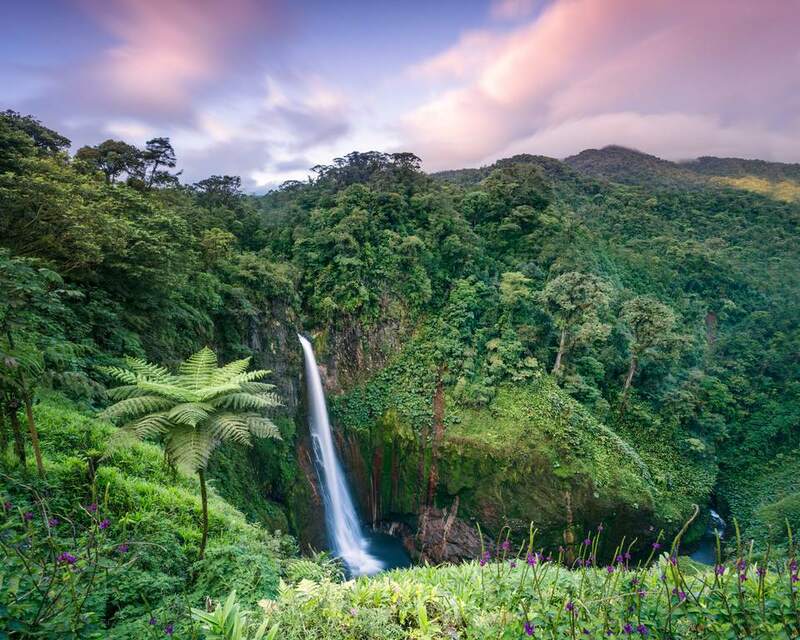 Costa Rica is a tropical country year round being that it is just north of the equator. The average temperature on the coasts is 81 degrees Fahrenheit (27 degrees Celsius). A variable that affects weather is elevation. The country has the Cordillera Central mountains, where temperatures can drop the higher you go. The mountain tops can fall to an average of 50 degrees Fahrenheit (10 degrees Celsius). Costa Rica has two coasts, with the Caribbean Sea on one side and the Pacific Ocean on the other. Humidity is usually higher on the Caribbean side where there is generally more rain. There are two seasons in Costa Rica—the dry and the rainy season. The dry season spans December to April, and the rainy season from May to November, coinciding with hurricane season. It's typically strongest in September and October, and some businesses will even close down during that time. The variables that affect the temperature in Belize are elevation, proximity to the coast, and the Caribbean trade winds. The average temperature along the coast is 75 degrees Fahrenheit (24 degrees Celsius) in January and 80 degrees Fahrenheit (26 degrees Celsius) in July. Except for the Mountain Pine Ridge, which is noticeably cooler, the inland region of Belize is slightly hotter than the coast. The country has 240 miles of coastline along the Caribbean Sea and has been devastated by many hurricanes over the years, primarily from August through October, which is also its rainy season. Panama is the closest Central American country to the equator and is the most humid. The country has two long coastlines, the Caribbean (or Atlantic Ocean) side and the Pacific Ocean coast, totaling 1,786 miles. Temperatures on the Pacific side of the isthmus are somewhat lower than on the Caribbean, and breezes tend to rise after dusk in most parts of the country. Temperatures are markedly cooler in the higher parts of the mountain ranges, and frosts occur in the Cordillera de Talamanca mountains in western Panama. The average temperature range on a typical summer day in Panama City is 75 to 86 degrees Fahrenheit (24 to 30 degrees Celsius). Temperatures rarely exceed 89 F (32 C). Guatemala’s coastal regions are typically the warmest parts of the country. The coastal average annual temperature is about 80 degrees Fahrenheit (27 degrees Celsius), but during the warmest months of March and April, the temperature can hit up to 100 degrees F (38 C). In the valleys between mountains, where the country's biggest cities such as Guatemala City and Antigua are, the temperatures are an average of 60 to 70 degrees Fahrenheit (16 to 21 degrees Celsius) year round. At the summits of the mountains and volcanoes, the temperature can drop to below freezing. Temperatures are generally cooler from November to February. The dry season from November until May is the time of year to go if you plan to be outdoors most of the time. Nicaraguan weather varies by region. Although most of the country's climate is described as tropical, mountainous areas like the north-central highlands of the Amerrisque Mountains have a much different climate than the coastal areas. Nicaragua has three distinct geographical regions: the Pacific lowlands, the mountains, and the Atlantic or Caribbean lowlands, also called the Mosquito Coast. Rainfall varies significantly in Nicaragua. The Caribbean lowlands are the wettest section of Central America and receive up to 250 inches of rain annually. The western slopes of the central highlands and the Pacific lowlands receive considerably less annual rainfall. May through October is the rainy season, and December through April is the dry period. During the rainy season, Eastern Nicaragua is subject to massive flooding along the upper and middle reaches of all major rivers. Honduran weather is considered tropical on both its Pacific and Caribbean lowland coasts with temperatures usually hovering between 82 and 89 degrees Fahrenheit (28 to 32 degrees Celsius) year round. The central and southern regions are relatively hotter and less humid than the northern coast. The climate tends to be more temperate inland in the mountainous areas. For example, the capital city, Tegucigalpa, is in the interior area and averages from 77 degrees Fahrenheit (25 degrees Celsius) in January to 86 F (30 C) in April. In the Caribbean lowlands, the only relief from the year-round heat and humidity comes during December or January when an occasional strong cold front from the north brings several days of strong northwest winds and slightly cooler temperatures. Temperatures in El Salvador vary primarily with elevation and show little seasonal change. The Pacific lowlands are uniformly hot; the central plateau and mountain areas are more moderate. Central America's wet season is typically from June through November; however, depending on the country (and even different parts of the country, as is the case in Nicaragua), rainfall can vary greatly. What to Pack: It's best to be prepared for rain anywhere and anytime when traveling to Central America during the wet season. Pack an umbrella, several foldable ponchos (to protect your backpack or other belongings if you end up walking in the rain), a waterproof flashlight, plastic bags for any of your electronics, and mosquito repellent as well as a net. You can also bring a book or game in case you spend a rainy day inside. And if you're traveling during hurricane seasons, be prepared for that as well by looking into travel insurance, having extra cash on you in the case of emergency, downloading weather apps to stay updated on alerts, etc. Central America experiences dry season from about November to April or May, as well as the hottest temperatures. This is the best time to hit the beaches, go hiking or biking, or any other outdoor activities you want to do. What to Pack: Bring a swimsuit to go to the beach, and bring lots of sun protection, including a higher SPF sunblock (applying frequently) and clothing that also can protect from UV rays. If you plan on hiking, bring a breathable long-sleeved top and pants to protect from bugs, and you can also use these if it cools down at night, depending on where you're headed.